We deal directly with the manufacturer and will cater to your needs, as our motto is "the customer is number one", service is our business. Here at the Lion's Den, there are many types of models to chose from as well as bore sizes. Our pricing is individal and that is our policy, as your specific requirements entail preferred merchanise Your specific request will be discussed and pricing and end cost will never be a surprise. We do our best to get you a quote that meets your needs and is comfortable with your pocket book. Tubes & barrels can be sold separately from carriages when required. Please state the type of model as it is required for a quote. Implements and cleaning sets are available on our accessories page. The GR2 stamping can be removed and the barrel marked US if desired. 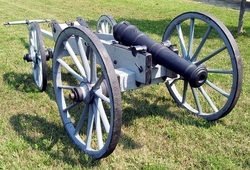 We are pleased to present our LT. 3lber barrel 2 ¼” bore, 46” long, weighs 250 lbs with the Royal cipher GR2. 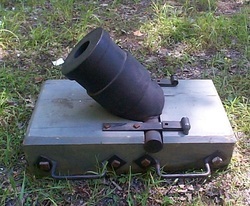 Cast on a 90,000 PSI high Pressure tube this barrel will meet your needs for LT Artillery, Fortress Garrison or Naval Gun depending on the mounting you chose. 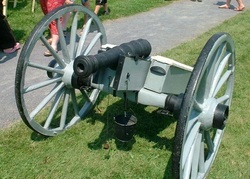 ​This an excellent reproduction of a rail gun 1” bore cast on a 70,000 PSI high pressure tube. 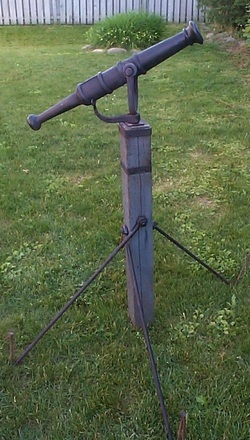 With cast on tiller supplied with yoke and support. 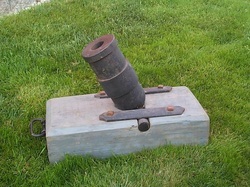 Suitable for fortress mounting or in small boats. 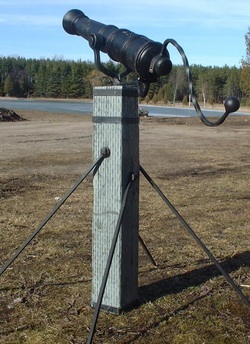 As shown with our post system for field use we also have mounting systems available for bateau or gun boats. 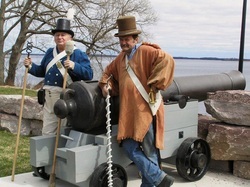 As shown with our post system for field use or mounting in a bateau or gun boat, we offer full range of tools and accessories for F&I, Rev War or 1812 to complete your impression.